Limbitless Solutions, a nonprofit organization started last May by Albert Manero with the goal of making affordable, 3-D-printed bionic limbs for children with amputations, helped build an “Iron Man” themed bionic arm for Alex Pring, a 7-year-old boy who was born with a partially developed limb. 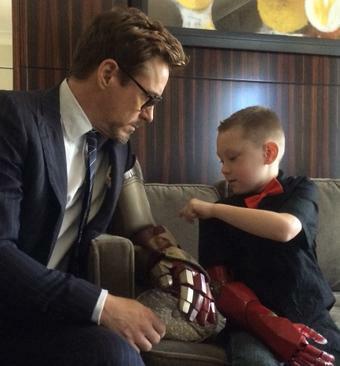 Alex received his new arm from non-other than Tony Stark himself, Robert Downey Jr.
Like all true bionics, the prosthetic is controlled directly by the mind. The arm works via surface electromyography. Electromyography (EMG) reads the electrical signal from the brain and transmits it to the arm, producing a signal that triggers the opening and closing of the hand. Manero said he was inspired by Ivan Owen, a special effects artist and puppeteer in Bellingham, Wash., who developed the first 3-D printed hand. Owen posted his design and instructions on Thingiverse, an online community to share 3-D designs.